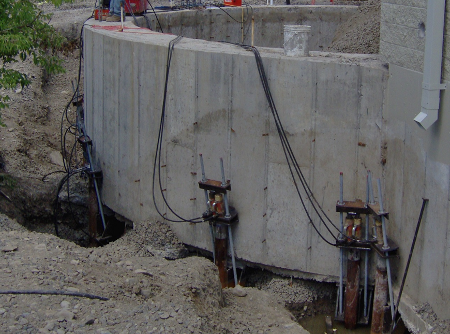 In short, your geotechnical survey for your upcoming building project is of the utmost importance. It’s an essential component of every construction job, mainly because it’s the only way to ensure structural stability, as well as human and material safety, moving forward. In general, a geotechnical survey includes an in-depth investigation of the soil to determine its type and therefore the composition, water content and strength of the soil as well as how it’s stacking up and compounding. This is often used to make an assessment in regard to the architectural plans and make alterations where they’re needed so the project can move forward successfully. It’s key to your upcoming project, so don’t skip it. 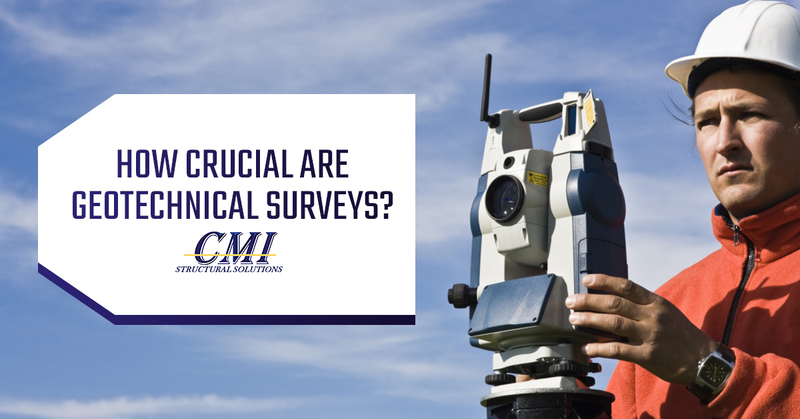 Contact CMI Structural Solutions to schedule your own geotechnical survey and analyze what geotechnical engineering services your project will require in order to have a successful project from start to finish. If you caught our last blog about soil mechanics and formation, you’ll understand, to an extent, how complicated soil can be. Analyzing that requires the mind of an engineer with an intimate knowledge of predicting the seemingly unpredictable formations and shiftings of soil. Thus, when you’re scheduling a geotechnical survey, it’ll be conducted by a geotechnical engineer, and hopefully, it’s a clever one. They’ll begin by finding information and running tests on the physical characteristics of the soil and rocks at your project site. Once they’ve collected a decent compilation of the data, they’ll be able to predict how to design earthworks and the foundation for your building. The geotechnical engineer will, of course, be able to both advise and execute earthwork alterations to accommodate your structure’s composition. 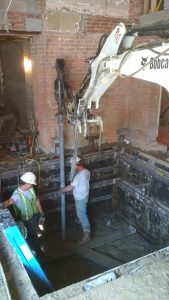 The survey will aid them in predicting what earthworks need to be done to the subsurface environment to ensure the building has a strong foundation and, thus, impressive structural integrity. The geotechnical examination’s value really comes in the analysis conducted on the subsurface environment, the soil sampling and the laboratory analysis. The process is classified as “soil sampling,” “foundation analysis,” “soil analysis” or “subsurface investigation.” This process is extremely important in areas that are even slightly prone to earthquakes. Exceptionally strong foundations, which only come from quality geotechnical survey and analysis, will go far when the very earth starts to shake the soil mechanics up. Depending on the location and the type of analysis, the geotechnical engineer will either make visual and what may seem like minor observations about the land, or it could be as complex as analyzing the inner workings of the soil mechanics of each kind of soil present on your parcel of land. A geotechnical investigation is a wide, sprawling and complicated process from the eyes of an outsider. They require in-depth understandings of geophysical methods, geologic mapping and photogrammetry. These processes, when used together, will aid in identifying if a certain soil type is likely to liquify under pressure (in the instance of an earthquake) and how the soil mechanics will react under a variety of different pressures. If a geotechnical engineer stumbles across a problem of this nature, they can often use the various other portions of the investigation to locate bedrock that they can use to create a design that will ensure the structure rests its weight on the bedrock, rather than on potentially unstable soil. With the development and supplementation of several other engineering studies and understandings, soil analysis has developed quickly. Geotechnical surveys from 30 years ago are much more primitive than today’s for this reason, meaning that the foundation and earthworks you create today will stand the test of time like no other. For example, innovations like ground-penetrating radar are now used to locate bedrock and do subsurface imaging which is then combined with the knowledge already collected from the studies surrounding the soil mechanics to create a comprehensive understanding of what kind of foundational design is required for optimal longevity for your structure. Reflection seismology has, in short, revolutionized the industry and rendered creating more than just functional earthworks and alterations totally possible. We’re passionate about making sure your building is around for a long time. We find the study and pursuit of creating innovative earthworks like our Geo-Joist to aid in the furthering of our entire species. Engineering is the new frontier, and we intend to be on the most influential side of it. Browse through our host of impressive earthwork solutions and resources to get a taste of our passion and then reach out to us. We’re eager to apply our skills to your needs. Contact us today!